I’ve enjoyed several books by Isabel Allende. I wouldn’t say she’s a firm favorite of mine, but her books are consistently entertaining. Having been a fan of her fiction for several years, I’ve gotten curious about her life. Her first novel, The House of the Spirits, was based on her family, and if you’ve read that book, you’ll know that her life was fraught with drama. Allende’s father, Tomás, was the Chilean ambassador to Peru, and his cousin was Salvador Allende, the Chilean president who was ousted in a military coup in 1973. So she has been close to a piece of modern history I know very little about. One of the most striking things about this book is its extreme subjectivity. Allende makes no effort to provide a well-researched modern history of Chile or a comprehensive memoir. There’s a vague sort of chronological structure, but it has more of a meandering style than a lot of memoirs do. 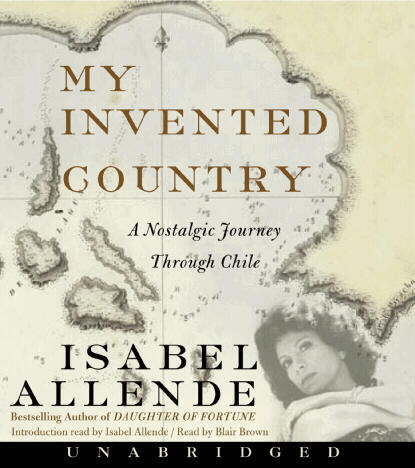 A memory might lead Allende to make general observations about the class structure in Chile, which might then lead to a memory of her experiences as a Chilean exile in Venezuela, which might then take her to her present life in California before she returns to her adolescence in Santiago. This is how memory works, but I don’t know enough about Allende’s life or about Chilean history to feel comfortable with this kind of structure. If I’d been reading a print version, rather than listening to the audiobook, I might have been a little less lost because I could have seen the road ahead and known, for example, that there would be a chapter about Venezuela and that I didn’t need to stress about not knowing the details of how and why she was there. One particularly interesting aspect of Allende’s subjectivity is the way it enables her to make sweeping assertions about Chileans, Americans, Venezuelans, women, the rich, the poor, and so on, without much in the way of support. The anecdotal becomes the universal. Normally, this would drive me crazy, and it sometimes did here. Allende does state that these are her memories, her observations, but she’s not as clear as she could be about where statements of fact end and personal reflections begin. Still, her anecdotal observations are compelling! In one section, she talks about class consciousness in Chile, sharing stories of people filling up shopping carts in the grocery store with expensive goods so they’ll be viewed as wealthy, but then surreptitiously leaving the cart in the store without buying anything. And then there are the people who had wooden cell phones made so they carry them around and look important. I would love to know if these practices were as common as Allende made them sound, but the fact that people did these things at all is fascinating. I would perhaps have preferred a bit more context and a little less universalizing, but overall I found the book, read by Blair Brown, worth listening to, as long as Allende’s comments are taken with a grain of salt. It’s memory and nostalgia, not a textbook history or travel guide. This entry was posted in Audiobooks, Memoir. Bookmark the permalink. I loved House of Spirits and I have enjoyed one or two other of her books. She’s not a knoch you socks off kind of writer but you can always count on her for a good read. I’ll have to keep this one in mind for future consideration. That’s exactly how I feel about Allende. She’s reliable and enjoyable. I’m rarely blown away by her books, but I always enjoy them. I still haven’t read anything by Allende. I had a book of hers for a while, but I felt exhausted by it every time I started reading it, and I kept putting it aside for later until eventually someone ordered it from me through PaperbackSwap. :/ I am so terrible about books in translation. Well, I certainly love the title of the book! I think I feel similarly to you regarding Allende: I think there’s a lot she does that’s admirable, but she isn’t an all time favorite of mine. It sounds like she provides a lot of insight into her past and Chile, even if they are simply her insights rather than universal truths. It would probably be wrong to judge the country based on her views alone, but they do certainly sound compelling! Like Other Jenny, I still haven’t gotten around to anything by Allende, despite her being on my list since forever. This one doesn’t inspire me much, but House of the Spirits seems like one to try. or possibly Paula. Yeah, I wouldn’t recommend it as a place to start. House of the Spirits is probably her most important book, but it’s not my favorite. I haven’t read Paula, but it’s one I want to get to. Did you know she wrote a book about Zorro? It’s a lot of fun, and I know you enjoy a good swashbuckle, so maybe that’s one to try. I’m ashamed to say I haven’t read any of Allende’s work yet. I’ve had Daughter of Fortune on my shelf for ages. Daughter of Fortune and Portrait in Sepia are my favorites of the Allendes I read. They’re a pretty good place to start, I think. I received The House of the Spirits for Chirstmas last year, but haven’t gotten to it yet — your review of this one makes me want to read it sooner than later. It’s definitely worth reading. Not my favorite Allende, but a good solid read. I actually haven’t read Allende at all, although I keep meaning to. I always struggle when I read a memoir about a place without knowing much history. Memoirs are always subjective, and I worry I’m missing some context details when my first exposure to a topic is memoir. I have the same concern, but then I also really like first-hand accounts and primary texts, so I try to read a bit of both when I can. I think Allende mostly gives sufficient context, as far as understanding the political situation goes. It’s just helpful to remember that her family was political and that would no doubt color her perspective–but she’s up front about that.